African lion populations have declined by at least 43% in the last 20 years, with few signs of abating. Today, there are as few as 20,000 in the wild. In Maasai culture, it is custom for warriors to kill lions as a traditional rite of passage into manhood. But at the behest of the cultural “fathers,” or elders, in the Amboseli ecosystem, Big Life Foundation established the Maasai Olympics in 2012. A culture-shifting alternative was created: conservation education paired with organized sports competitions based on traditional warrior skills. Today, warriors compete for medals and prizes instead of killing lions. Every two years, participating warrior villages select teams and compete in a series of regional one-on-one tournaments leading up to the final, action-packed event with athletic performances, spirited but sporting rivalry, and no dead lions. Athletes compete for recognition, express bravery, attract girlfriends, and identify leaders in six events: 200m, 800m, and 5,000m races, javelin for distance, rungu (wooden club) for accuracy, and the high jump, Maasai warrior-style from a standing position. As young women are often the motivators behind warriors wanting to hunt lions, and they are also potential conservation advocates, their inclusion is critical. Young women compete in two events: the 100m and 1,500m races. The conservation impact has been measurable. 84% of surveyed Maasai warriors who participated in the 2016 Olympics said that the Maasai Olympics was a good or very good alternative to traditional lion hunting. 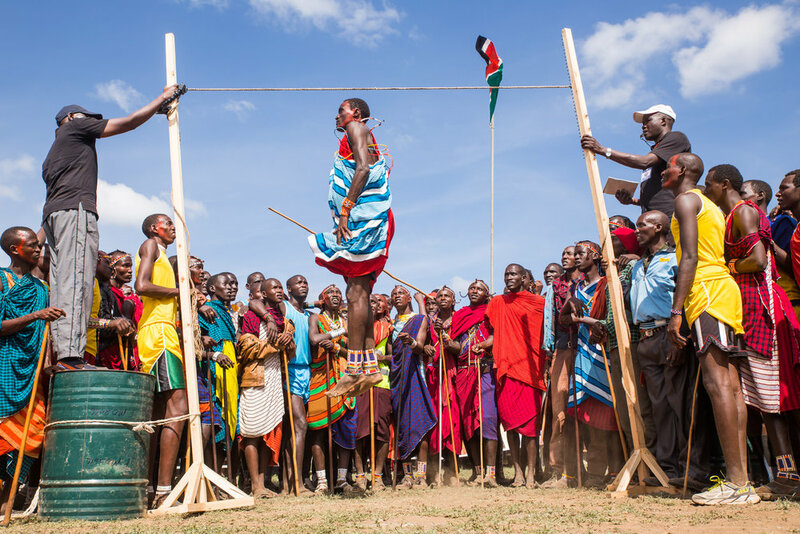 Following numerous conservation education meetings throughout the ecosystem, regional competitions for the 4th Maasai Olympics competition began this past August and for three months, warriors tested each other, looking to see who would come out on top. The Final, where all four teams will come together to battle it out, has been scheduled for December 15, and the warriors are buzzing with anticipation. Event winners receive individual medals, prizes, and public recognition for their skills, but the winning team also takes home a trophy and prize breeding bull. Having been inspired by the Maasai Olympics The Elephant Society is looking to bring the Games to Hong Kong in 2019 as an inter schools and inter company competition. The idea is to base our Elephant Week in 2019 around the ethics and ideals of the Maasai Olympics, bringing education and increased awareness to youth through the sportsfield. Human Wildlife conflict is an increasing issue worldwide and one that is not limited to Africa. It is also the second largest threat to elephants after poaching and an increased awareness of how animals live, the space they need and how best to negotiate this with the need of humans has saved both human and animal lives. In 2019 we aim to bring the top competing athletes from the Maasai Olympics to work with students and adults in Hong Kong in a unique week of the meeting of cultural and sporting minds. This will only be possible with the support of sponsorship along with schools and companies wishing to be involved. Please contact Colin Dawson or Luke Li for further details.